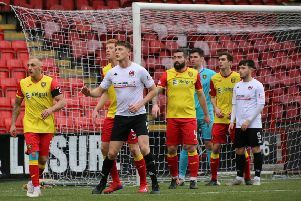 Chris McStay has signed a new deal with Clyde. Clyde boss Danny Lennon has secured the services of three more key players for the coming season. Latest to sign up is midfielder Chris McStay who enjoyed a successful loan spell from Australian side Sutherland Sharks. The 22-year-old son of former Celtic and Scotland legend Paul McStay has agreed to extend his stay a Broadwood and has signed a one-year deal. Also back at the club on a permanent basis is Mark Lamont who has been snapped up after his release from Partick Thistle. Lamont (20) was also a successful loan signing last season, playing a key role in the side’s surge up the table and winning the club’s Goal of the Season award. And Lennon has also drafted in the vastly experienced John Rankin. The 34-year-old - who left Queen of the South at the end of the season - began his career at Manchester United and has also enjoyed spells at Ross County, Inverness Caley Thistle, Hibernian, Dundee United and Falkirk. Rankin has also signed a one-year deal.